I am a Head teacher since 6th December, 1999 and continued with satisfactorily till now. My passion was to teach kids. Children are very much innocent so that my dream comes true when I faced a government interview and got a chance to join as a teacher. My father also was a teacher. From my girlhood I observed my father, how to dedicate himself to improve the students’ capability and also enjoy his profession. Its hearten me to become a teacher. As the education rate of our country is not in the satisfactory level, we can’t reach the developed country status yet. However, children get admitted in the primary school but most of them don’t complete the curriculum. This problem is more acute for girls because of high rate of childhood marriage. It was an immense barrier of our primary education system. I thought if I were a principle of a school then I can handle the problem strictly and also, I would create a way of reducing gender discrimination with the help of my colleague. It came true when I joined a school whose maximum students were girls. After that I made a plan to keep them at least five years to complete the cycle of primary schools. I even welcome them in my house for after class study thus helped them to achieve good results. In this way, more students participated in the scholarship examination and most of them were awarded by Bangladesh government scholarship every year. It was my great motivation and I do it till now. I am well known teacher beyond locality. All guardians inspire me when I take part any local and international workshop and competition. My superiors help a lot of British council’s online schools and Microsoft educator communities. I worked also in the Teacher portal of Bangladesh government which is called in Bangla (Shikkokh Batayon) national platform. Where I shared a lot of PowerPoint (PPT) subject based contents for students and teacher. I love using technology and always try to use new tools. I want to convey the world into my classroom for students as well as for colleagues by Skype sessions. Now a day, I am taking part in a lot Skype lesson and working for achieving a goal of a project S.D.G with Argentina. I try to meet with supportive teacher for getting advice on how to enrich in my local area and country education system so that we enrich the quality of education. It is our government’s commitment. I encourage my students to collect teaching elements from near area which are available and cheap. I try to make my students thinking innovative by proving them with plenty of opportunity to create new things. So, in our local area we arrange teaching aids fair, there we display students and teachers creative things. This a one kind of competition where students can exchange their idea with other school’s students. I participated them in a virtual field trip by Skype session . Bangladesh has a sub tropical monsoon climate by wide seasonal rainfall,high temperature and humidity. March to June is cool,June to October is rainy, October to June is dry winter .My students try to find out what is Climate,Why change the season? They were know in Bangladesh has six seasons, such as Summer, Rainy, Autumn, Late autumn, Winter, Spring. Now a day they can observe only three. Why it is ? They try to find out by allowing one week , At first i help them made an (Office mix) the cause all over our country then they will go to their community watch and write the cause by brainstorming. Bangladesh is a density of populations country! Approximately 170 people live in the country where the area is 1570 sq km. So the swage system and unplan industries garbage, smoke and kitchen; wastage people through here and there. Moreover reconditions cars black smoke is very bad for the environment. So air pollution is a big problem for our country. So our students try to find out the problem and the solution and compare with other countries how to recover or reduce gradually or how conscious soon among ourselves. By helping of teacher they watch all over countries present conditions . Then students (9 years old) they have visited near community in groups.Find out by sight visiting Polythene,plastic bottle,kitchen garbage through here & there ,cattle bathing in the near pond and canal,Brick field smoke,recondition car smoke etc are main causes of their localities problem of climate change. After that they make poster paper and act out with these solution with some of peers. The cause of Air pollution. The students searched nearby why air is getting more polluted! They are very young, I help their innocent work, while they are finding. Amazing my students thinking and made me impressive. Embedded video for The cause of Air pollution. discussing with peers. They understand the heat of sunlight can enter inside the plastic bottle could not come out for that the inside environment will be faster hot.The heat captured inside the glass house is known as green -house effect.The utmost ozone layer full with carbon dioxide,methane and UV increase in the atmosphere due to human occurrences. 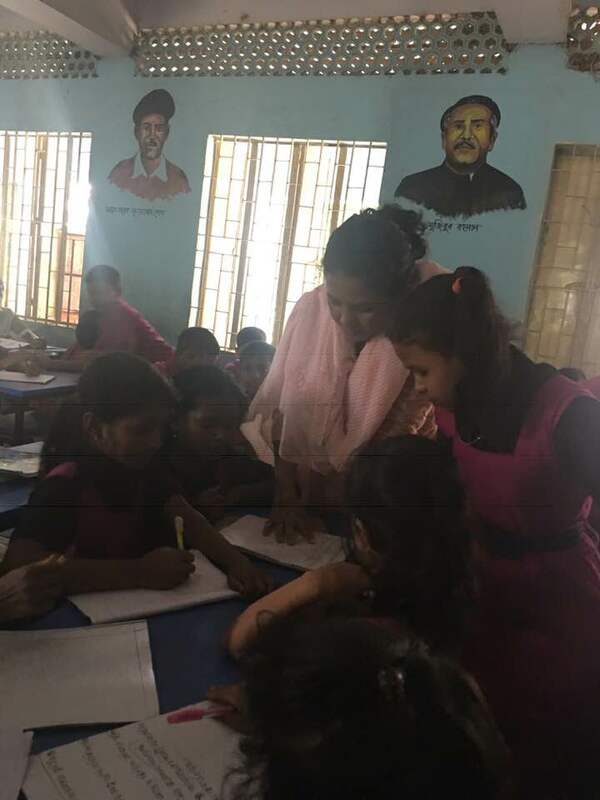 My students are working since 3 weeks, By the help of ours (Teachers) they find out the main causes of Bangladesh as well as world.After that they find the solution from their own language. Now it is time to share the present condition of Bangladesh and participating countries so that the students can understand about own and compare with others. The feed back of our students. They have made many Skype call and exchange with Asia sub-continent as well all over the participators countries. What happen and what are going on . birds(Like Sparrow) gradually dis crease. Now the have made awareness about our schools areas sparrows. Embedded video for The feed back of our students.